Provides Wilderness EMT, Widerness First Responder, WIlderness First Aid, and Wilderness Advance First Aid courses, as well as wilderness upgade course for EMTs in the U.S. and abroad. CME available. Provider of courses in Wilderness First Responder/EMT Transition, Wilderness I/II, Wilderness First Aid, Wilderness Med ALS, and Introduction to Wilderness Medicine. Emergency care education center offering wilderness first aid through WEMT courses, seminars and workshops on wilderness medicine. Wilderness Alert offers comprehensive wilderness first aid training and certification. Also offered is a wide range of first aid products, rigorously field-tested to work when you need them most! A comprehensive directory of Canadian wilderness tour operators and outfitters. The site provides visitors with a complete resource centre to make all arrangements for their wilderness adventure. The Wilderness backpacking website is dedicated to providing useful information for wilderness campers and backpackers. Idaho hunting and fishing trips. Providing quality wilderness experiences in the Idaho Wilderness for over 35 years. Provider of Wilderness First Responder, Wilderness EMT, and Wilderness ALS courses, as well as swiftwater and rope rescue. Wilderness EMT, Wilderness First Aid, Wilderness First Responder, and Medical Person in Charge courses. Wilderness First Responder is a wilderness medical training course held in Telluride, Colorado. Providing wilderness pack trips, fishing, and elk and deer hunts. A Christian based wilderness youth camp for young women. Wilderness by canoe, sea kayak, raft and backpack in Alaskas Arctic and glacial fjords. Offering educational wilderness adventures to people of all ages who wish to truly experience and learn more about the natural world. Guided canoe and sea kayak trips in the Near North wilderness. Canadian Wilderness Trips offers selection of all inclusive canoe and sea kayak adventures for the novice to expert from one to five days. Includes trip descriptions, dates, photos, rates, online booking, FAQs, and contact information. Based in Toronto. Offers elk, deer, bear, bighorn sheep, and mountain goat hunts on the Frank Church - River of No Return Wilderness, Idaho. Offers wilderness survival, nature awareness, and primitive skills courses for children, teens, and adults in the Mt. Shasta Area of California. Teaches wilderness survival classes on topics such as navigation, edible and medicinal plants, water procurement, signaling, and fire making. Workshops, summer camps, instructor training, and expeditions focused on wilderness skills and community building. Provides schedule and pricing. Summer wilderness travel expeditions for young adults - sailing, backpacking, sea kayaking and whitewater rafting the wilderness, waterways and seas of North America. An outdoor Christian ministry that offers training in search and rescue techniques and emergency wilderness survival skills for men, women and children from all walks of life. Teaches bushcraft and wilderness survival skills, including tracking, plant lore, nature awareness, axemanship, canoe-craft, and wilderness cookery. Based in the UK. If the business hours of Crested Butte Outdoors Wilderness Medicine Instruction in may vary on holidays like Valentine’s Day, Washington’s Birthday, St. Patrick’s Day, Easter, Easter eve and Mother’s day. We display standard opening hours and price ranges in our profile site. We recommend to check out cboutdoors.com/ for further information. 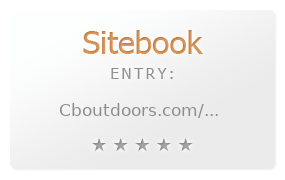 You can also search for Alternatives for cboutdoors.com/ on our Review Site Sitebook.org All trademarks are the property of their respective owners. If we should delete this entry, please send us a short E-Mail.